This Crow Style Motorbike Leather Jacket is slightly tight fitted from waist. Jacket is less stiffer if wear without motorcycle pads. 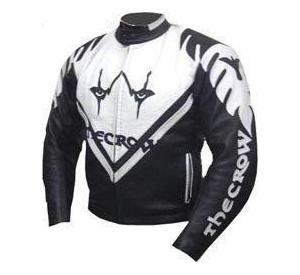 This Crow style Motorcycle Racing Leather Jacket is made with Cowhide Leather 1.2~1.3mm, the leather is milled grain. 8 inch connecting zip to join to leather trousers. Suitable for all weather conditions.